Company FASPAR was founded in 1961 and, originally named FASANI & PARINI s.n.c., it started to produce punching and drawing tools for metal sheet processing. FASANI & PARINI s.n.c. develops also the necessary enslavements for the building and the starting of complete plants, suitable for its customers (uncoilers, straightener machines, advancers, transfert, stamp change systems…). In 1981 the firm’s requirements need a new configuration and structure so FASPAR Spa was born. FASPAR Spa are renowned for producing quality slit coils and packs without damaging the surface finish or edges. Steel, Stainless steel, silicon steel, aluminium , non-ferrous materials and alloys. Cold rolled, hot rolled, pickled, surface treated. Dry or oiled, lacquered, hot-dip galvanised or electro galvanised, aluminized. Material strengths of above 1400 N/mm2 and yield limit up to 1000 N/mm2. High productivity and output by consistent reduction of setting times and high production speed. True dimension of blanks and slit strips in length, width and angularity. Minimum burr cutting process with clean cutting edges. High winding accuracy when rewinding the strips to edge aligned coils. Most careful treatment to protect strip surfaces. Perfect levelling results of sheets and strips. Best stacking accuracy by application of most suitable stacking system. High line availability and life time by integration of high quality components of renowned manufacturers only. Individual, custom tailored complete solutions for your finishing lines. 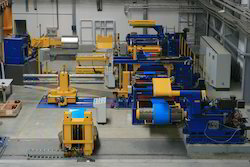 FASPAR Spa manufacture high quality lines for Aluminium and Prepainted. Aluminium , non-ferrous materials and alloys. FASPAR Spa manufacture high quality lines for Mild and Galvanized Steel. 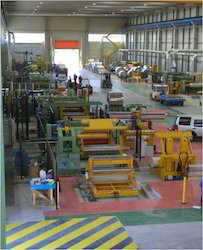 FASPAR Spa manufacture high quality lines for Stainless and Prepainted Steel. Stainless steel and silicon steel. 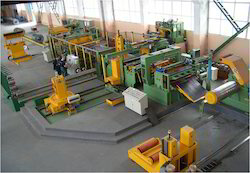 FASPAR Spa manufacture high quality lines for Brass, Copper and Stainless Steel. Dry or oiled, lacquered, hot-dip galvanised or electro galvanised. Stainless steel, silicon steel, titanium. 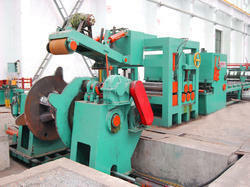 Looking for Slitting Line from Faspar, Italy ?